First Published June 23, 2011 in New York Press. It was 6 p.m., and after a long, boring Wednesday at the office I hopped off at the G train two stops away from mine, at Fulton Street. I’d stopped here often over the last nine months or so, to grab a drink at Moe’s before I headed home. I’d started coming to Moe’s on a rumor that my editor had sent me to sniff out, about some shady business behind the 10-year-old bar’s closing. Originally slated to shutter in February, Moe’s had an extended, and sometimes tense, negotiation process that finally ended in late April, after the owners—Ruby Lawrence and Chelsea Altman—couldn’t reach a deal with the landlord. He was more than doubling the rent, and he seemed to be eager to bank on the proximity of the spot to the new arena being built in downtown Brooklyn. 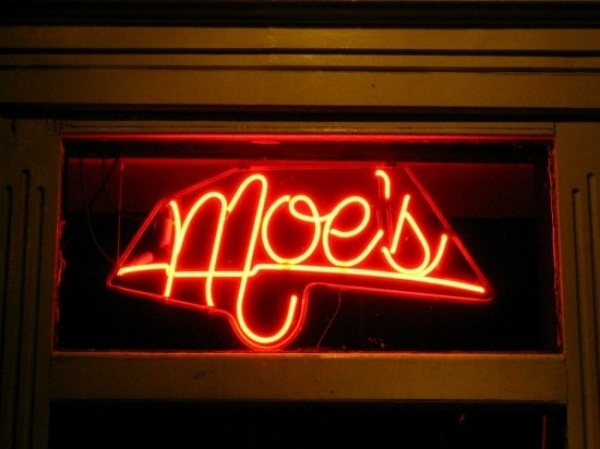 As I followed the story of Moe’s, I got to know, and drink with, the regulars. Like Brian, whose shaved head, earrings, tight black T and tattoos threw newcomers off the scent of his genuine sweetness. Or Peaches, the flamboyant college professor who brought down the house on karaoke nights. Or Ruby, the owner, who you could find tossing a couple back at happy hour on Wednesdays, which were “lodge nights”—a night few of the Moe’s family ever missed. But yesterday, as I climbed the steps to the street, I knew I wouldn’t be getting a taste. Although the day I had truly warranted one, the new bar that was having its opening night party at the old Moe’s didn’t yet have a liquor license. Plus, I was boycotting. Butch told me this as we sat across from each other at one of the four crowded picnic tables across the street. Ralph, of Ralph’s bodega directly in front of Mo’s, painted the tables last week and set them up so the regulars would have a place to sit. They brought signs, they brought cognac-and-peach-juice punch, they brought matching Moe’s shirts. And they protested. I spotted a familiar face at Mo’s among the unfamiliar new décor of refurbished wood and TVs. Alex Salas, a bar back for Moe’s for the last 2 months before they closed, told me he decided to stay on as a doorman. these regulars will ever cross the threshold of the new Mo’s.